El Jardin de Paraiso was not the first community garden in the East Village, but it's one of those that was built on a site, the photograph of which is pretty well known. 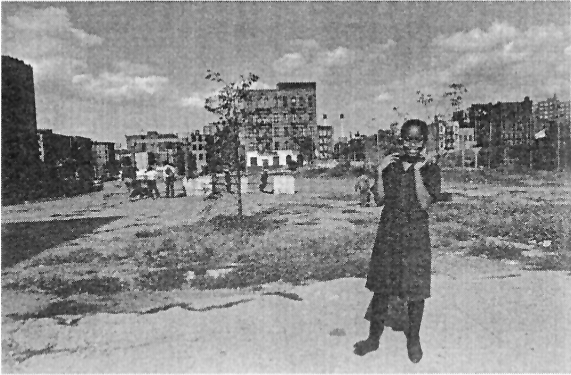 Screen shot of a photo by Marlis Momber, from a PDF of a book on Amazon. Today it's a thriving garden. However, this has been a Summer of very little rain. Compounded by a tear in the tarp beneath it, the pond was very low this year, resulting in the many goldfish and turtles dying. It's possible that some were saved — moved to other gardens, and such. The result however is that they're no longer here. Where Have All the Anarchists Gone? When Jesus Knocks, Will You Answer? Outside Office, or Performance Art?